Yanghee Lee, UN human rights special rapporteur to Myanmar, speaks to journalists during a news briefing in Yangon, Myanmar, July 2017. The Myanmar government has barred a United Nations human rights envoy from visiting the Southeast Asian nation to assess the rights situation for the rest of her tenure after it deemed a previous mission report she issued was biased and unfair. More than 650,000 Rohingya from northern Rakhine state fled across the border to Bangladesh during the crackdown which began in late August to escape attacks and village burnings by the military and ethnic Rakhine mobs. Lee’s last visit in July came 10 days after the Myanmar government said it would deny visas to members of a U.N. fact-finding mission appointed under a resolution in March to investigate atrocities that Myanmar security forces committed against the Rohingya during a previous four-month security sweep in Rakhine’s northern townships that began in October 2016. Since then, Lee and other U.N. officials have been highly critical of the government’s response to attacks on the Rohingya during the crackdown that began in August, of its denial of access by independent media and international humanitarian groups to areas affected by the violence, and of its refusal to let in the U.N.-appointed fact-finding mission. “Only two weeks ago, Myanmar’s permanent representative informed the Human Rights Council of its continuing cooperation with the U.N., referencing the relationship with my role as special rapporteur,” Lee said in the statement issued on Wednesday. Nevertheless, Lee said she hopes Myanmar will revisit the decision. News of Lee’s denial of entry into Myanmar spurred both criticism and praise. Human rights groups, including London-based Amnesty International, were quick to take the government to task for banning the envoy from the country. Tun Khin, a Rohingya activist and president of the Burmese Rohingya Organisation UK, said the military is behind the ban on Lee. Aung Myo Min, director of Equality Myanmar, an NGO dedicated to human rights education and advocacy programs, expressed surprise at the announcement. “Refusing to collaborate with her means the current government is doing the same as military governments did in the past,” Aung Myo Min said, referring to the 50 years when an army junta ruled the country following a coup in 1962. “The Myanmar government is responsible for allowing the international community and media to freely cover news in the crisis area and for granting them permission to question all related communities so they can obtain the truth,” he said. But Monywa Aung Shin, a spokesman for the ruling National League for Democracy (NLD), said he agreed with the government’s move. “I think the government’s decision to ban Yanghee Lee is right,” he told RFA. Sit Myaing, vice chairman of the Myanmar National Human Rights Commission, questioned whether those like Lee who write special reports on Myanmar’s rights situation demonstrate good will toward the country when it comes to improving human rights. Former information minister Ye Htut said the government’s decision to not allow Lee into the country will likely lead to more pressure and criticism of Myanmar from the outside. 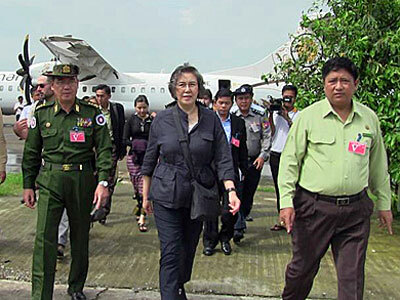 In contradiction to Lee’s previous comments that she could not travel everywhere she wanted to in Myanmar during her July visit, Ye Hut said the government allowed her to go wherever she wished during that time and that Aung San Suu Kyi had explained to her various issues concerning the country’s human rights situation. In a report to the United Nations General Assembly in October, Lee slammed the Myanmar government and military commander-in-chief for their response to the exodus of the hundreds of thousands of Rohingya fleeing atrocities in northern Rakhine. That same month, the European Union decided to cut its exchanges with Myanmar’s top military officers as first step to increase sanctions. A month later, the United States also said it was eliminating invitations to Myanmar’s top generals and would pursue possible targeted sanctions on individuals who committed atrocities. Rights groups have called for the U.N. Security Council to impose an arms embargo against Myanmar's military and targeted sanctions against the country. Ye Htut, however, said that two of Myanmar’s closest allies will likely prevent that from happening. “There will be more pressure on and comments about Myanmar, but in my opinion, Myanmar won’t have serious sanctions imposed on it as long as China and Russia are backing us,” Ye Htut said. The Human Rights Council appointed Lee, a South Korean national, to her current position as special rapporteur in 2014. The rapporteurs are part of the Council’s Special Procedures, comprising a body of independent experts and independent fact-finding and monitoring mechanisms that address specific country situations or thematic issues around the world. Thematic special rapporteurs are usually appointed to serve for three years, after which their mandates can be extended for another three years. In all, Lee has made six trips to Myanmar and issued constant warnings about the persecution of the Rohingya, a stateless minority group denied Myanmar citizenship and access to basic services because its members are considered illegal immigrants from Bangladesh. Reported by Kyaw Kyaw Aung, Khin Khin Ei, and Thinn Thiri for RFA’s Myanmar Service. Translated by Khet Mar. Written in English by Roseanne Gerin.